Attawapiskat, Ont., has often been a bellwether for the state of the relationship between Canada and First Nations. Two years after the community declared a state of emergency following a rash of youth suicides and suicide attempts, the youth centre promised by the federal government has not yet materialized. On a recent afternoon in Attawapiskat, on a street near the sewage lift station that's said to be at its breaking point, a small boy spoke about a skeleton-like wraith that scoops up children caught walking alone after dark. "There's a thing that kills you," said the boy. "It flies and it's big." Then he was off, a shaggy mutt nipping at his heels. That is one story. But there is another kind of wraith in Attawapiskat, born not of shadow but boredom, that seems to scoop up the young and plunge them into darkness. "Every time I am on Facebook, I always see these depressed statuses," said Tyler Hookimaw, 18. "There is nothing really in this town, nothing fun for the kids." It's a Tuesday evening in February, and Hookimaw is making dream catchers with leather, feathers and yarn in the parish hall, which has become a shelter from boredom. About a dozen teenagers shout and dance in a room brimming with Lady Gaga rhythms and the scent of homemade pizza browning in the oven. Every now and then, the door swings open as more teens clomp in, their jackets and boots dusted by the swirling snow. This oasis was created by local couple that secured some funding to set up a weekly arts night at the parish hall to give the youth an escape — a warm, open and safe space. For now, it's the only communal place outside of school and the local arena for them to let loose, be themselves and find an outlet for the endless and sometimes uncontrollable energy of the teenage years. "They say, 'Thank you, we appreciate it, we need a place to hang out,'" said Jackie Hookimaw-Witt, who runs the arts night with her husband, Norbert Witt. "Sometimes they do art and they show something personal." They typically bring in an Elder and close the night with a prayer, she said. "And if a girl is crying, we will help her," said Hookimaw-Witt. Hookimaw-Witt said she began holding the arts night to meet the gaping need in the community for programming specifically aimed at youth struggling with depression. In the spring of 2016, Attawapiskat youth was in the eye of another crisis. The crisis began after a 13-year-old girl named Sheridan Hookimaw died by suicide in the fall of 2015, leading to a steady swell of suicide attempts and ideation cases that forced the federal and provincial governments to mobilize an emergency response. In the midst of this, Carolyn Bennett, who is now the minister for Crown-Indigenous Relations, promised the youth a recreation facility they could call their own. "They have asked for a youth centre where they can come together and work with families, elders for cultural and wellness programming," said Bennett at the time. "Starting immediately, we will begin to work with the community and provincial partners to plan and design such a space, as well as put in place the 'on-the-land' programming that they had requested." Two years on, there is no youth centre from Ottawa. There are no conceptual drawings or a timeline for the project. All that exists is a vision document based on input from youth that took months to develop. Attawapiskat has often been a bellwether for the state of the relationship between Canada and First Nations. The housing shortage that came to a head in the fall of 2011 triggered a humanitarian intervention by the Red Cross, embarrassed the Stephen Harper government and magnified the dismal state of infrastructure in similar communities across the country. A year later, the Idle No More Indigenous rights movement burst into the national consciousness with Theresa Spence, then the chief of Attawapiskat, embarking on a liquids-only fast on Victoria Island, in the shadow of Parliament Hill. Then, after the newly elected government of Justin Trudeau announced in 2015 that it was reshaping its relationship with Indigenous peoples, Attawapiskat was plunged into a crisis of suicide attempts and ideation cases. It was one of the first tests for the new Liberal government to show the country its approach to the relationship. Trudeau tweeted out support for Attawapiskat youth, Bennett promised the youth centre and met the prime minister with a delegation from the community. While Ottawa's promise has yet to materialize, the community will soon see the doors for a provincially funded "interim youth centre" open in a month or two. It can't open soon enough. Linda Friday, a counselor at the Vezina Secondary School, said that when Bennett announced the youth centre, it created a spark of hope. The children "were happy for a while and then they lost hope, too," she said. "They were waiting for the youth centre to open. It's not open yet." This Cree community of about 2,000 residents lies huddled on 2.35 square kilometres of land between the banks of the Attawapiskat River to the south, the airport to the north and floodplains to the east. The river cuts a silver path through the muskeg to James Bay, 12 km away, just over the horizon. Attawapiskat sits on what is known as reserve number 91A. 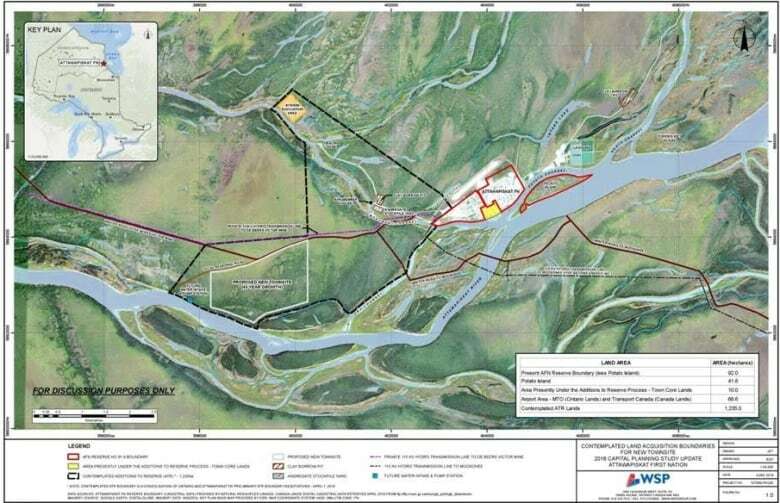 The community has another, much larger section of land, roughly 270 square kilometres in size, according to an engineering report by firm Genivar Inc., which sits further inland and about 180 km to the northwest. The current Attawapiskat community grew around a chapel erected by Catholic Oblate missionaries in about 1894 and the Hudson's Bay Company trading post built in 1901. During that time, the Cree from the region would gather around these outposts for goods, to find spouses and attend religious services, and then return to their trapping and hunting grounds. In 1905, the federal government signed Treaty 9 in Fort Albany, which sits about 114 km south of Attawapiskat. According to research by the late John Long, a former professor emeritus at Nipissing University, the Cree believed the government would become a custodian of the land, providing the Cree with services like education and health care while they could continue unimpeded in their traditional ways. People didn't start living in Attawapiskat year-round until the 1950s, when log houses were built with moss as insulation, followed by wooden-frame homes provided by the Department of Indian Affairs. By the 1980s, the department knew the community's housing levels were failing to keep up with population growth, according to an academic paper published in that era by Kathryn Molohone from Laurentian University. Today, the problem is substantially worse. Since the severe housing shortage in Attawapiskat exploded into a national crisis in 2011, the community has seen 50 new housing units built. But the waiting list is 300 families long. There are currently 16 housing units in various stages of construction. According to Attawapiskat CEO Wayne Turner, the housing density here is about seven people per household. That is nearly triple the Ontario average of 2.7 per household. An engineering report produced for the community in 2011 concluded the community needed about 595 new houses by 2030. Linda Friday lives in a condemned house with two bedrooms for her family of five. Through her work at the secondary school, she has seen first-hand that overcrowded housing has a major impact on the mental health of youth and their ability to take advantage of an education. According to 2016 Statistics Canada census data, 31 per cent of Attawapiskat's population is under the age of 14. "They face crowded housing, mouldy housing," said Friday. "They can't study, there is too much noise in the home, and they can't do homework." Tyler Hookimaw, who is a cousin of the late Sheridan Hookimaw, was among the young people caught in the suicide attempt and ideation crisis in the spring of 2016. "I've been through a lot here. I've been bullied since Grade 2. I stopped going to high school for a year because I got bullied," he said. "It hurts me a lot. The past few years have been hard for me." The teen years are difficult for most, but things are magnified here. There is the inter-generational legacy of residential schools and poverty, as well as a lack of outlets for youth in a community with limited internet hookups in most homes and only one highway out, an ice road that lasts barely two months of the year. Boredom rises, and boredom becomes a gateway to drugs. First comes marijuana, then pills and speed, said Tyson Sutherland, 18. "Doing drugs is mainly the one thing to do," he said. Sutherland said that in Attawapiskat, marijuana goes for $20 for half a gram and $40 will get you a Percocet pill. "I had a drug addiction," said Sutherland. "Firstly it was weed, then I moved onto speed and meth. I started huffing gas." This leads to a spiral of depression and more drug use. 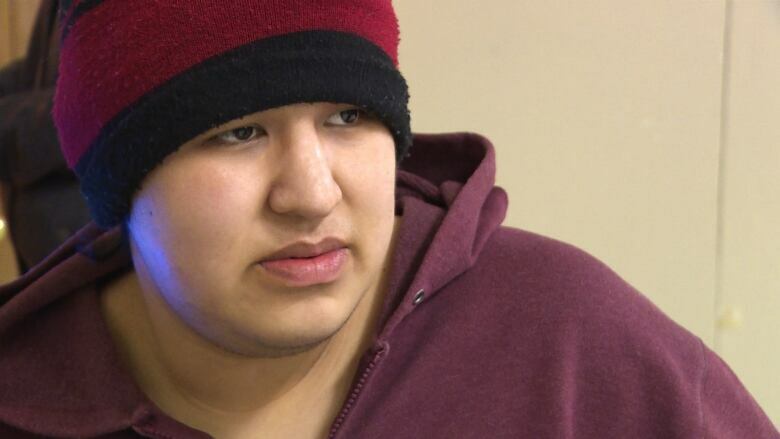 Hookimaw said some youth think drugs like marijuana can take away depression, but he believes it just makes things worse and creates a dependency that can lead to harder substances. Sutherland and Hookimaw said the community is in desperate need of a place for youth to gather. They said the interim rec centre will bring a welcome reprieve. "With the [promise of the] youth centre, it made me happy the youth will have somewhere to do go, something to do other than drugs," said Sutherland. "I think it will have a positive effect here." But all the best intentions and promises from Ottawa will mean nothing here if they remain echoes and air. Two years after the initial promise of a youth centre, there is little to show. It took this long to simply get consultants to gather input from community youth on what they wanted, said Wayne Turner. "By the time a consultant was recruited, it was about three or four months. The visioning exercise took about six months. The final report has been issued now for about three months," said Turner. "There was a commitment made and it's taken longer than anticipated." Turner said the size of the youth centre and the inclusion of some aspects requested by the youth (like a swimming pool) may make the project, as laid out in the visioning document, extremely difficult to execute given the community's remote location and strained infrastructure. He said the building intended to house the new youth centre would need to be about two-thirds the size of the community's new elementary school, which can accommodate 540 students. Turner said the community's water and sewage infrastructure is at or nearing the breaking point and needs a significant upgrade to handle all the new housing Attawapiskat desperately needs. He doubts it could deal with the load from a new large building with a swimming pool. Turner said federal department officials want to meet with the band leadership "to review what is going into the facility in order to address what the project scope can be, and also its impact on community infrastructure." He said the price tag for the project remains largely unknown. "In terms of the implementation of it, I think that is where all the challenges come to the forefront," said Turner. "We are an isolated area, we do have higher costs associated with this area. The project envisioned to be X dollars actually ends up to be X-plus." Meanwhile, a $1.2-million Ontario-funded "interim youth centre" is finally nearing completion and will be housed in a renovated building that was once the band office. In late February, construction was at full throttle inside and outside the renovated space. While tools, stepladders, assorted machinery and tubs of vinyl adhesive cluttered the rooms, it was clear the centre was starting to take a comfortable shape. Turner described the eventual layout of the place, pointing out where the computers would be, the pool tables, the kitchen and the meeting room with its circular window that on this day was drenched the interior with sunlight. "One of the challenges they did have is that it was an old building. They have cited… upgrades required to the foundation as one of the contributing elements to the delay in getting it going," he said. There are some in the community who believe the interim youth centre will actually become the permanent one. 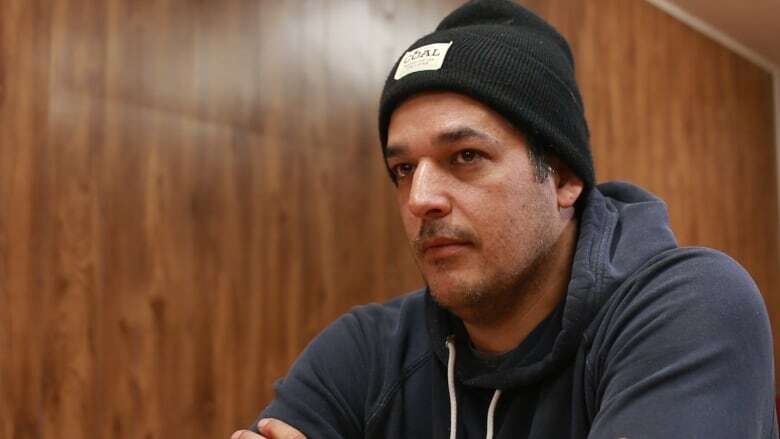 "I don't believe we will ever see a permanent youth centre [from Ottawa]," said Attawapiskat musician Adrian Sutherland from the band Midnight Shine. He's heard this song before. "We were promised a new school and we fought for how many years?" said Sutherland. "We all know the story of Shannen's Dream." He's referring to Shannen Koostachin, an Attawapiskat student who led the campaign for a new school, until she was killed in a car accident in 2010 at age 15. Sutherland, who is also helping to bring a pharmacy to Attawapiskat, said he doesn't believe the answers for the community are found at the end of a federal bureaucrat's pen. "I think the biggest issue is our community spirit is broken. How do we get our mojo back?" he said. "We need to find a way to fix what was broken. We need to reconcile the wrongdoings that have been done to our community. It is still very much alive. I am still pissed off that my mom had to go through what she did. I still have to find a way to heal and let go of all that anger and frustration." Sutherland's mother attended St. Anne's Indian residential school at Fort Albany First Nation, about 114 km south of Attawapiskat along the James Bay ice road. Attawapiskat health director Shirley Gagnon said the impact of the residential school left survivors scarred with levels of post-traumatic stress similar to that of war survivors. St. Anne's, which began as a Roman Catholic mission affiliated with the Oblates of Mary Immaculate and the Grey Nuns of the Cross, is considered to have been one of the most notorious residential schools in Canada. Children at St. Anne's, who primarily came from the Mushkegowuk region (which includes Attawapiskat), regularly experienced beatings, sexual assault and other forms of cruelty. For a time, the school used a homemade electric chair for punishment. "I got broken bones from there, a lot of memory scars," said Gagnon, a St. Anne's survivor herself. She said the pain and despair from the brutality is still "carried on to many generations of people." Attawapiskat is still in a mental health crisis, but the difference today is that the crisis is being managed, she said. "Risk management is what we are doing." Gagnon said there have been slight improvements since the federal and provincial crisis response in the spring of 2016. She said most of it is felt at the provincially run hospital, where there have been changes to the way patients are processed and handled during a mental health crisis. While the community has crisis counsellors, and mental health workers fly into the community every month, there are no permanent mental health clinicians, which are needed to deal with the deep-rooted trauma. If someone is suffering from a mental health crisis, they are taken to the hospital for an initial assessment and then flown south by medevac or on their own to North Bay and Kingston for treatment. "They are assessed for three days and then they are deemed fine and then they return to the community with these referrals for this and that," said Gagnon. She said the referrals are useless, because they are for services, such as those of a therapist, that don't exist in the community. People "are fine for a while and then it starts back up again." There are also no detox facilities in Attawapiskat, and Gagnon said the community is currently facing an amphetamine crisis. "It's difficult to withdraw from those drugs," she said. "As a result, people keep using it over and over again, and things are happening in the community." A land-based detox program that will provide holistic therapy for eight- to 18-year-olds is planned for the coming months, she said. The federal government spent $179,790 for trailer accommodations to house two mental health clinicians, but no one is applying to fill the positions. "Health Canada made good on their promise, they got the trailer. However, it's a challenge recruiting people to come work in the community," said Gagnon. The First Nations and Inuit Health Branch, which is now under Indigenous Services, provides $1.25 million a year to Attawapiskat and the Mushkegowuk Tribal Council for youth mental health, said the department. It also provides $425,000 for mental wellness teams that serve the region. Gagnon said the burst of mental health support that followed the crisis made things worse in some ways. "When the crisis started, they dropped in all these crisis counsellors from all over the place. They came into the community and they counsel or de-escalate the crisis and then they leave," she said. "So you opened up all these people with all their pain and their grief, and there is nothing for them." Gagnon said Attawapiskat needs dedicated mental health clinicians who can speak the Cree dialect of the community. "The way [people] express themselves, their feelings or understanding of things is so much different when they actually speak Cree as opposed to when they are speaking English," said Gagnon, who is a fluent Cree speaker. Gagnon said one of the main problems affecting the delivery of all health services to First Nations is the lack of federal Indigenous bureaucrats in policy-making senior positions. There is a disconnect between program designed in Ottawa and the realities on the ground, she said. Gagnon believes the youth centre will do some good, but it won't address the underlying issues. "A youth centre will help keep the youth busy," said Gagnon, who worked for the First Nations Inuit Health Branch in the federal public services. "It's the mental health programs, the mental health supports — that is what is needed." Attawapiskat is currently in talks with Ontario and Canada to convert provincial Crown land into reserve land so the community can expand to the west and build new housing. This expansion will also require a new water source, a new water plant, a new electrical grid, new sewage system and new roads. Turner said the estimated cost of this expansion ranges from about $300 million to $400 million over 20 years. Indigenous Services said in a statement that the addition-to-reserve lands process was "in the late stages." The department said it was providing funding this year for an infrastructure feasibility study that is expected to be completed by the fall. "Once third-party interests are addressed, Canada and Ontario can begin the transfer process," said the statement. As for the youth centre, Indigenous Services said it is working with Attawapiskat to support "its vision and long-term plans." The department said it had shared a draft proposal in February for "discussion" and provided $188,000 to Attawapiskat for a project manager to "see the project to completion." The interim youth centre is expected to open its doors by April. For Adrian Sutherland, whether the youth centre will ever get built is really a side issue. The future of Attawapiskat, which is close to his heart, is in the hands of the youth. And he believes they are already rising to the challenge, with or without Ottawa's help. The kids are going to be alright. Back at the Moose Takeout, Sutherland said he's contemplating changing the name of his eatery's signature burger, with fry bread buns, to the "Fattawapiskat." He laughs about not having to display the calories on the menu as dictated under Ontario law because he's on-reserve. Indeed, there's a certain freedom here that keeps drawing him back home. "I feel wild and free here," he said. "I enjoy this beautiful place. We have the rivers and the bay and everything." He said there is also a pride, strength and deep capacity to forgive here that, despite the hardship and years of mistreatment by the federal government, refuses to be subdued. "There is a lot of fire and fight in people here," he said. And that fire is burning hotter. "Our young people are going to rise up and begin to change this place." This story is part of our project Beyond 94: Truth and Reconciliation in Canada. Read more stories in the series and look for further coverage this week.